Gain control over a cockroach infestation, and your customer will reward you for it with loyalty, referrals and stellar reviews. No one wants these filthy, disease-carrying and allergy-causing pests in their homes or businesses. Cockroaches are resilient, however, and infestations can be difficult to control. No wonder: They date back about 140 million years, according to the Entomological Society of America (ESA). Fortunately, pest management professionals (PMPs) have plenty of options. “The key to cockroach control, honestly, is being just as adaptable as they are,” says Josh Fleenor, president, Pest Pros Pest Solutions, Sacramento, Calif. “Don’t get stuck in a ‘this is how we have always done it’ or ‘this always worked before’ mentality. With more than 4,000 species of cockroaches in the world, knowing which one(s) you’re dealing with is imperative. You won’t gain control until you understand the biological habits of the cockroaches you’ve been called out to eliminate. Use your training to positively identify the pest. If you’re not sure what species you’re dealing with, consult with an entomologist or a university’s entomology department. Reference sources such as Truman’s Scientific Guide to Pest Management Operations or the National Pest Management Association’s (NPMA’s) Field Guide also are helpful. Because cockroaches prefer dark, out-of-the-way places, a thorough inspection is a must. During your initial inspection of a customer’s home or business, check the spots in which cockroaches are known to hide. Cockroaches need water to survive. Damp, dark areas like basements and sewers are good places to start. Sometimes, a thorough inspection is nearly impossible. Customers who refuse access to areas, won’t move items or clear out clutter may make your job difficult. Educating customers is a must. Tell them what they need to do to help you get their infestation under control. Melville says he meets with the decision maker for the account to discuss the cockroach problem and explain the pest control plan. Because customers often don’t know why they have cockroaches, it helps to explain why the conditions in their homes or businesses are favorable for these pests. For instance, let them know why they must eliminate moisture in the basement or keep their kitchens clean, and then insist they follow through with your guidelines. After your initial inspection, map out a plan your customer can follow to help eliminate conducive conditions. Some PMPs provide easy-to-follow written instructions, whereas others explain in detail, face-to-face, what needs to be done. Smith says a combination of both is best. Consider charging a cleaning fee, which includes labor and materials, if customers cannot or will not complete the task themselves, Smith says. Above all, make sure customers are aware that sanitation is key to the control of cockroaches. Ignoring this important step will hamper control efforts. 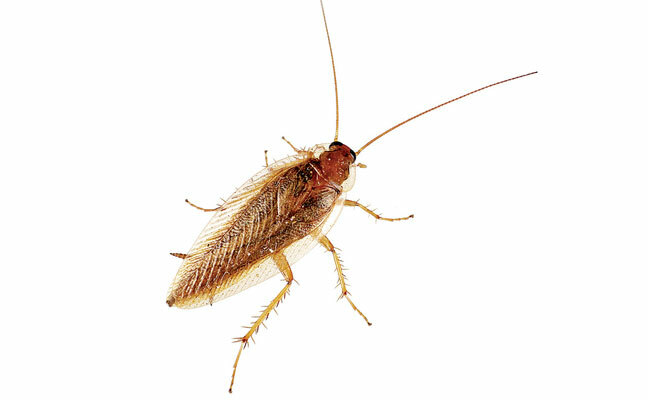 “If food is left out, dirty dishes are in the sink or dishwasher, and crumbs are on the floor or counters, cockroaches are smart enough to eat at those locations rather than the bait that is left out for them,” says Boyd. Think twice about working with customers who do not resolve their sanitation issues. “If they don’t follow good sanitation practices, you have to make the decision to walk away from an account,” says Lee Tubbs, owner, Enviroguard Pest Solutions, Ringgold, Ga. Lack of cooperation by customers is one of the biggest obstacles to complete control. Customers may have no desire to clean up after themselves, be unable to sufficiently remove clutter, or lack the funds to make needed repairs. Working with customers in multi-unit housing presents additional challenges. To facilitate control in multi-unit housing, tenants must immediately report cockroach sightings, building owners must eliminate conducive conditions, and PMPs must have the ability to inspect adjacent units. He suggests organizing a meeting with tenants, maintenance staff and property management, and educating them on their roles and responsibilities. Effective communication may result in 100 percent cooperation. All that’s needed is a little training and a lot of knowledge. Once you develop your cockroach control protocol, share it with your customers. Share the details of the work you plan to do on the initial visit, and let them know how long it will be before you return for a follow-up visit. Encourage customers to call you if they have questions or if cockroaches appear in places you did not note in your inspection report. He also advises giving customers your expectations of the results that should occur over the next few service calls. “For example, if you are baiting for cockroaches, explain that they may actually see more activity over the next few days, as cockroaches come out to feed on the bait you placed,” says Smith. PMPs have several tools in their cockroach control arsenal. Many are simple and reliable products that have worked for decades. One tried-and-true tool is the vacuum. It allows you to collect cockroaches out of hard-to-reach cracks and crevices. It also eliminates dead cockroaches, cast skins, droppings and other debris. Another useful tool in the quest for cockroach control is the monitor, or sticky trap. “Insect monitors are your eyes 24/7 for pest activity, and will give you clues if used correctly,” says Smith. These low-cost devices are especially useful when first assessing the infestation, explains Melville, because each one will tell you a story. You can learn a lot by noting which caught adults, which have nymphs, which direction they entered the monitor, and of course, which monitors show no activity at all. Monitors also may be helpful in showing the source of cockroaches before an infestation occurs. For example, German cockroaches (Blattella germanica) are known to hitch a ride in shipments of boxes and crates. PMPs have found that when it comes to cockroaches, pesticides alone do not ensure control. Success depends on several factors.